This summer at the OSU Craft Center I taught a 4 week class where students were challenged each week with a different call and response. I wanted to share the pieces that I created as demos and that were inspired by the class. 1) Repetition/ Pattern- can work on a set, many similar pieces that come together to form a larger form, surface design patterns, practice a form that's challenging. This piece started with extruded tubes that I formed into several large spirals and attached together to form a more abstract sculpture. I impulsively added the figure and that change immediately made gave the piece a strong narrative quality. I named it "riding the wave" and joked that I could either focus on it during labor or smash it! Finished "Riding the Wave" sculpture, 15"long x 7"tall x 4" wide, 2014, Stoneware, extruded and hand built form, Red iron oxide and bare clay woman and cobalt based blue glazes on sculptural wave. 2.) Scale- go tiny or go big, but get out of your comfort zone. For this example I decided to demo throwing off the hump and make some teeny tiny little pots and a tea set. Finished Set of tiny dishes, glazed with a white glaze and hand painted with cobalt carbonate. 3.) Symbolism= (an artistic and poetic movement or style using symbolic images and indirect suggestion to express mystical ideas, emotions, and states of mind.) Students were challenged to use symbolism in their work- either in terms of the form of a sculpture or by carving or adding texture to the clay itself or through painting/ transferring surface designs. Small tray decorated with hand carved stamp of a hummingbird that I made, carved tree design and commercial "imagine" stamp. Clouds and ground hand painted with underglazes. High fired to cone 10. 4.) Mixed Media Project. Students were challenged to create a clay piece with the intention of adding some other medium to it. Some examples were light fixture or candle holder, adding wooden features, glass or organic matter. The "10 minute" tea pot- (although mine took 25 minutes)- everyone created a quick hand built tea pot as a warm up. This exercise forces you to let go of much planning and allows you to create spontaneously. 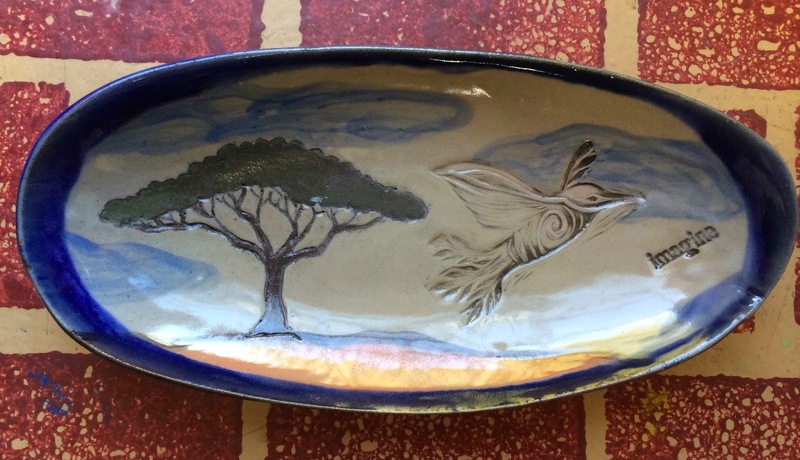 Diana Ryan is a ceramic artist and instructor in Corvallis. She fell in love with clay in 2002 while studying at the University of Oregon and graduated with a Bachelor of Arts Degree in Art (with a ceramics focus) and Environmental Studies in 2006. 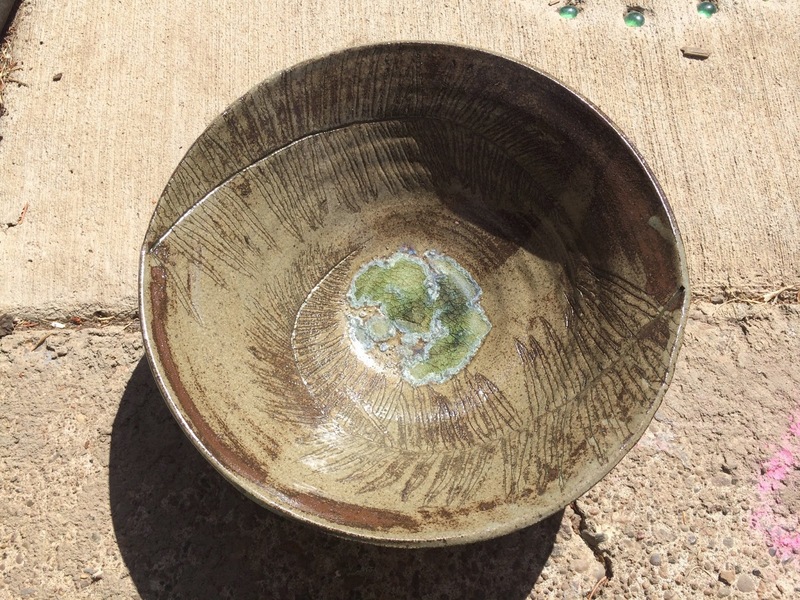 Her post college years have been spent making her own art and inspiring others through teaching art classes at the Corvallis Arts Center, OSU Craft Center, and through teaching residencies in the Corvallis, Albany and Philomath School Districts. Diana currently teaches private classes at her home studio in South Corvallis in addition to creating her own work and raising her family.